Palawan is considered as the Philippines' last frontier due to its unspoiled environment and rich biodiversity. Along with its crystal turquoise waters, world-class diving spots, marvelous caves, breathtaking forests, anyone would surely be fascinated with this paradise. Not to mention the beach resorts that particularly emphasized how beautiful Palawan is! 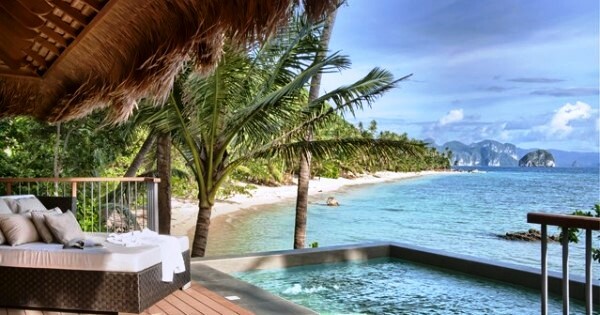 #1 - El Nido Resorts - Pangulasian Island: Fall in love with El Nido's beauty even more in this hotel that is set overlooking the waters of Bacuit Bay and opposite a tropical forest. Its outstanding palm-thatched villas, superb amenities, excellent dining experience, and remarkable customer service would surely leave you wanting more. An active advocate of sustainable tourism, this hotel also protects the marine and wildlife sanctuaries in the area. #2 - Amanpulo Luxury Resort: Find solace in this secluded resort in Pamalican Island accessible only by private plane. This award-winning resort is surrounded by the white-sand beach and coral reefs of Sulu Sea complemented by their sophisticated casitas and villas. You have nothing else to ask for--world-class service, great staff, mouthwatering dishes, relaxing spa, unrivaled cruising experience, and a very stunning view--they have it all! #3 - Sangat Island Dive Resort: Practically straight out of a postcard, this resort occupies a large portion of Sangat Island encircled by limestone cliffs and white sand beach. The resort features native-styled guest accommodations, professional staff, all-inclusive buffet meals, and a wide variety of adventure-filled activities. The famous World War II Japanese shipwrecks are just minutes of boat ride away from the resort and they can arrange a diving tour for you. #4 - Qi Palawan: Forget all your worries and just unwind in this private hotel with only seven exclusive cottages and villas. Twenty meters away from the unpopulated beach, you have a choice whether to take an island tour, dive, snorkel, try kiteboarding, paddleboarding, or just relax by the shore. The open-air bar and restaurant serves a great selection of food and drinks and is made for chilling out as well. #5 - Daluyon Beach and Mountain Resort: Perfectly located along Sabang Beach and near the UNESCO World Heritage Site and New 7 Wonders of Nature, Puerto Princesa Underground River, this 4-star resort is one of the leading resorts in Puerto Princesa. It also boasts of its cozy accommodations with private balcony each, sumptuous local and international cuisine, eco-friendly facilities, and quality service. #6 - El Rio y Mar Resort: A Spanish phrase meaning "the river and the sea," this resort can only be accessed by sailing across a mangrove river to the Sulu Sea. The ride itself is magnificent as you can see the water changes its color from emerald to blue, what more the resort! Featuring 5 types of well-appointed rustic rooms, two infinity pools, al fresco restaurant, complimentary activities, island tours, and a variety of facilities--you surely would have a vacation to remember. #7 - Sheridan Beach Resort and Spa: Set out and explore more of Puerto Princesa in this resort that serves as a gateway to the paradise that Palawan is. There's always something for everyone as they offer adventurous activities and tours as well as health and leisure recreations. Along with the fully-equipped rooms, there are also amenities such as gym, outdoor pool, and a beachfront organic restaurant and 3 bars.